People whose vitamin D levels test high before going on a diet experience better weight loss than those with lower levels, U.S. researchers say. 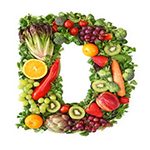 The study found for every increase of 1 nanogram per milliliter of 25-hydroxycholecalciferola -- a precursor form of vitamin D found in the blood -- study participants lost almost a half pound more on their calorie-restricted diet. Additionally, higher baseline levels of both precursor and active vitamin D predicted greater loss of abdominal fat. "Vitamin D deficiency is associated with obesity, but it is not clear if inadequate vitamin D causes obesity or the other way around," Dr. Shalamar Sibley, the study's lead author from the University of Minnesota in Minneapolis, said in a statement. The findings suggest the possibility that the addition of vitamin D to a reduced-calorie diet will lead to better weight loss. However, there is a need for "the right kind of controlled clinical trial to determine if there is a role for vitamin D supplementation in helping people lose weight when they attempt to cut back on what they eat," the researchers said. The study was presented at the annual meeting of the Endocrine Society in Washington.